PHOTOS: Washington State History Museum Bridge of Glass Hostage Crisis Update! Imagine Tacoma with out the fence Julie Anderson fought so hard against. You can still sign the petition and email WSHM board members. David Boe, what say you? 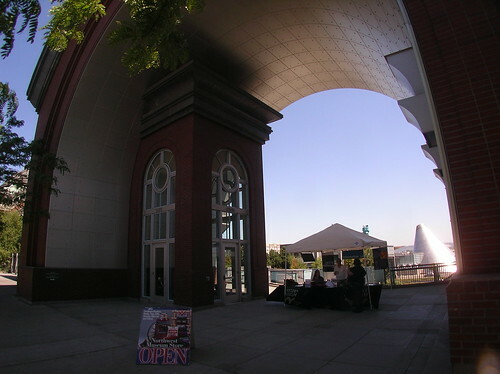 Dale CThihuly bridge of Glass, Tacoma Washington. 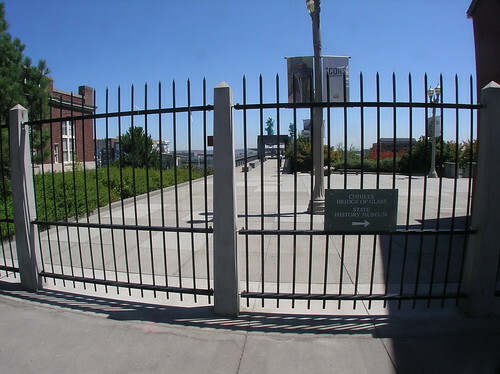 Direct route blocked by Washington State History Museum Fence. They had hoped to erect a brick wall here. this week the Sales team or whatever has set up shop obstructing the only passage way to the bridge of glass. When David Nacadri says removing the fence would drive a dagger into the heart of the Museum's business interests he's not kidding! How else would their sales people be able to harass pedestrians? I brought my trusty harbor freight measuring tape. Their troop of telemarketers were blocking about 75% of the public access way. LIBERTY and JUSTICE... LET MY PEOPLE BRIDGE GO! Anybody have an acetylene cutting torch? by NineInchNachos on 7/15/2010 @ 9:52pm yikes unsolicited divs! by fredo on 7/15/2010 @ 10:24pm Gotta agree RR. 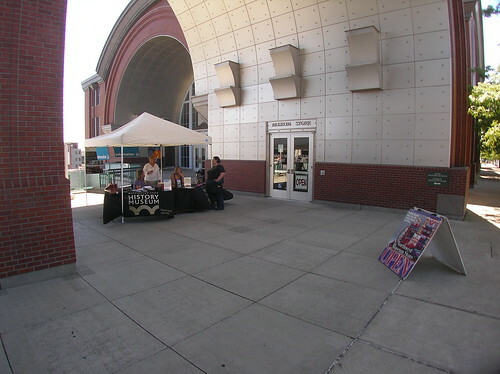 No explanation for the fence or why the museum needs an informational table right outside the entrance to the museum where there is another informational table. As one of our most popular presidents once said, "Mr. Gorbachev, tear down this fence"
by L.S.Erhardt on 7/15/2010 @ 11:08pm The did tear down the wall. Which was then promptly reassembled 2000 miles away in Israel. As former Councilmember Anderson noted in the comment line of that post, she expressed her determination to see this fence down by the end of her term. Since I am now fullfilling the unexpired remainder of her term, I have 17 months, 2 weeks and 2 days to Set the Chihuly Bridge Free (and maybe provide some green to the Plaza known as Tollefson). Thank you for your assistance in this endeavor. by fredo on 7/16/2010 @ 8:28am Ship the fence to Arizona where it might serve a useful purpose. It would be a way we could achieve some Reconciliation with the State of Arizona who we recently treated very badly. Thank you for your comment Mr. Boe. Good luck sir! 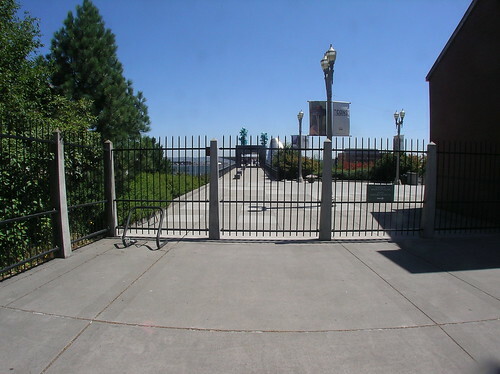 The City of Tacoma has exhausted legal avenues to remove The Fence. Yes, The Fence is erected on a public easement. But that easement was negotiated between the History Museum and the City long ago. A contract remains in effect. It can not be ignored. The contract allows a fence to block the bridge. The Fence Needs to Go! The only thing that will bring down The Fence is an effective public relations campaign, which goes far beyond the blogosphere. An elegant writer must draft a manifesto, focused on the City’s positive momentum, its civic ideals, the basic tenants of urban design, and our love for the History Museum. The manifesto must demand removal of the fence, at the Museum’s expense, before the Tall Ships arrive. Demonstrate that a large segment of our community is degusted by this decision to erect and maintain The Fence. by Erik on 7/16/2010 @ 9:23am It looks like the chair of the person at the table is even placed an additional 5 feet out of the tent for additional blockage reach. by NineInchNachos on 7/16/2010 @ 9:29am she was even holding her arms out like that the whole time! 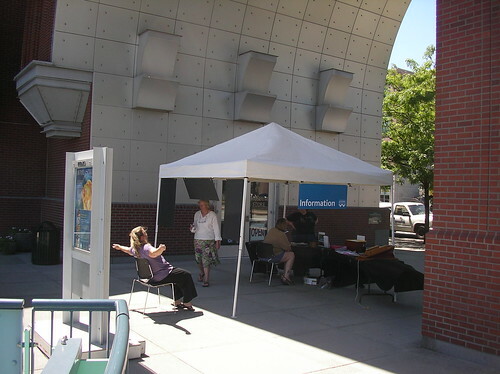 by fredo on 7/16/2010 @ 9:33am People who set up a tent in a covered area would be described as pessimists. by Jesse on 7/16/2010 @ 3:58pm Death to the fence. You do have to have bollards or something there to prevent some moron trying to drive across the bridge. See also; Spanish Stairs. by Maria on 7/16/2010 @ 5:43pm What is the purpose of the fence? I can see the point of limiting access late at night, but is there any other reason to block off daytime direct access to the MOG bridge? by NineInchNachos on 7/18/2010 @ 12:15pm the History Museum is so deathly afraid of being ignored it needs to direct foot traffic past it's info sign. by Crenshaw Sepulveda on 7/18/2010 @ 12:59pm Building a spite fence is no way to engender the support of the public. We all know what the museum's intentions are but I am sure they are failing in achieving their goal. History may not be for wimps but the museum is ensuring that it isn't for anyone else either. by fredo on 7/18/2010 @ 1:47pm Remove the fence and put in a couple of small stages for street performers. There's a guy down there with his drum set sometimes. He would look so awesome on a little riser. If there's no scheduled performer then they could put the goddess of commerce on the riser. This would surely draw in the tourists.